Central Institution of Fisheries Technology is seeking talented Indian nationals who are looking for Engagement 02 Research Assistants positions. 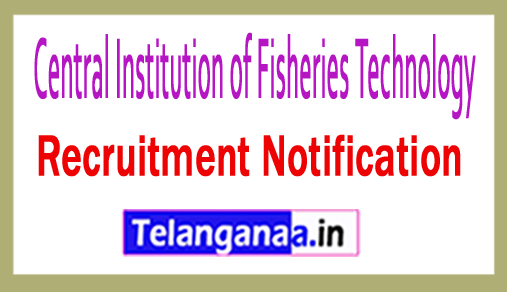 Recently, the Central Institute of Fisheries Technology has released a notification works for Recruitment CIFT. To complete this hiring process, was considered qualified for such positions, the interview walkin can participate on July 28, 2018 in the right place. Academic Information: These candidates have a minimum qualification, as applicants wishing to apply for CIFT jobs can become a recognized entity through MFSc (Fish Processing Technology / Post-harvest Technology / Control and Quality Assurance of Fish) / M.Sc (Science Food / Technology / Biochemistry) apply. The maximum age for applicants applying for a job is 35 years (men), 40 years (women) as on 28.07.2018. Monthly payment: after the appointment of applicators, the organization will pay Rs. 25,000 / -. Jobseekers are interested in applying for the above positions, first they must visit the official website http://www.cift.res.in. After reading the complete instructions, participants must participate in the walkin interview with all relevant documents at the address below. Walk in Interview conducted on: 28.07.2018. Click CIFT recruitment notification here. Central Institution of Fisheries Technology (CIFT), invites Application for the post of 02 Senior Research Fellow. Walk-in-Interview 05 January 2017. How to Apply CIFT Vacancy - Interested Candidates may appear for Interview along with self-attested copies of all the Certificates in support of their claims regarding age, educational qualifications, scheduled caste/ scheduled tribe/ OBC etc. The original certificates shall be produced for verification before the interview. Candidates should bring detailed bio-data affixing a recent passport size photograph.